Despite the fact that I’ve become a far more adventurous eater in the last few years than I ever was before, there are some flavor combinations that make me hesitate. Even when I know it’s a classic pairing and one that many people love, sometimes I just have a hard time wrapping my mind around it. One of those combinations is strawberries paired with balsamic vinegar. I am always worried it will taste too much like, well, vinegar. Clearly, I’ve been overthinking it. (Overthinking things is a special talent of mine.) Back in April we visited Josie and she made us a fantastic strawberry balsamic ice cream. 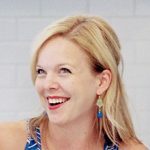 Manners definitely trump weird food quirks so of course I ate it, and to my surprise I kind of loved it. The balsamic was barely there, and if you didn’t know you probably wouldn’t have guessed it, yet it added a special something to that ice cream. So…same deal here. 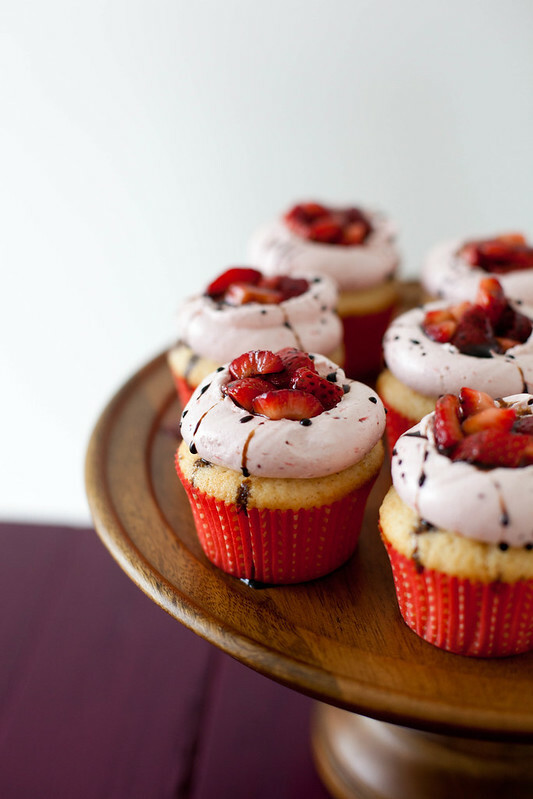 A fantastic strawberry cupcake that is just a little bit different and a little bit more awesome because of it. I opted for a browned butter cupcake base so that the balsamic flavor would not be entirely obscured by something like a strawberry cake. The frosting is the ever popular strawberry Swiss meringue buttercream. A little nest of macerated balsamic strawberries and a balsamic drizzle pull it all together. And it is good…very good, indeed. I took them to a party over the weekend to see how they would be received by others and they got great reviews. In fact, they seemed even more popular than the funfetti ones I brought along as well. 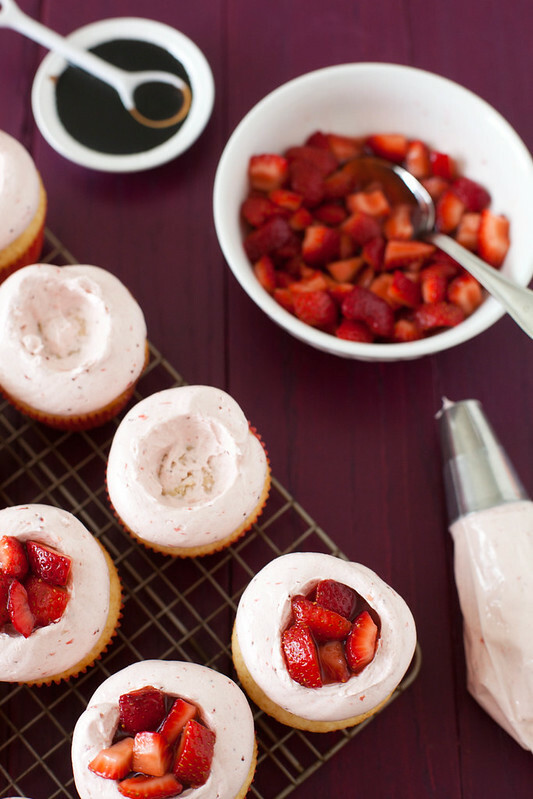 So let’s all raise a strawberry balsamic cupcake to stepping out of our comfort zone and trying new things. Preheat the oven to 350˚ F. Line cupcake pans with paper liners. Place the butter in a large skillet over over medium heat. Let melt and continue to cook, swirling occasionally, until the butter is a deep golden brown color (be careful not to burn it). Set aside to cool slightly. Transfer the butter to the bowl of an electric mixer. Add in the sugars and beat on medium speed until smooth and the bowl is slightly warm to the touch. Meanwhile in a medium bowl, combine the cake flour, baking powder and salt. Whisk to blend. When the butter and sugars are adequately mixed, beat in the eggs one at a time, scraping the bowl as needed between additions. Blend in the vanilla. With the mixer on low speed, add in the dry ingredients in three additions alternating with the buttermilk, beginning and ending with the dry ingredients. Mix each addition only just until incorporated. Divide the batter between the paper liners, filling each about 2/3 of the way full. Bake, rotating the pans halfway through, until a toothpick inserted in the center comes out clean, about 18 minutes total. Allow to cool in the pans 5-10 minutes, then transfer to a cooling rack to cool completely. For the frosting, combine the chopped strawberries, 2 tablespoons of the sugar and balsamic in a small saucepan. Cook over medium heat, stirring occasionally, until the berries have softened and the liquid is somewhat reduced, about 5-8 minutes. Let cool slightly, then transfer to a blender or food processor and puree until smooth. Chill the mixture well before use in the frosting. Combine the egg whites and the remaining 1¼ cups sugar in a heatproof bowl set over a pot of simmering water. Heat, whisking frequently, until the mixture reaches 160° F and the sugar has dissolved. Transfer the mixture to the bowl of a stand mixer fitted with the whisk attachment. Beat on medium-high speed until stiff peaks form and the mixture has cooled to room temperature, about 8 minutes. (The bowl should be cool to the touch.) Reduce the speed to medium and add the butter, 2 tablespoons at a time, adding more once each addition has been incorporated. If the frosting looks soupy or curdled, continue to beat on medium-high speed until thick and smooth again, about 3-5 minutes more (or longer – don’t worry, it will come together!) Blend in the strawberry-balsamic puree until smooth and completely incorporated, scraping down the sides of the bowl as needed. To make the topping, combine the berries, sugar, vinegar and vanilla in a medium bowl and stir to blend. Let sit at least 20-30 minutes. Meanwhile, make the balsamic drizzle by combining the balsamic vinegar and brown sugar in a small saucepan or skillet. Heat over medium-high until bubbling, then lower the heat and continue to cook until significantly reduced (about 4 tbsp.) Set aside to cool slightly. Transfer the frosting to a pastry bag fitted with a large round tip (I used Ateco #809.) Pipe a round of frosting onto each cupcake. Use the back of a spoon or an offset spatula to scoop out a small bit of the center of the frosting to create a well. Add a spoonful of the macerated strawberry mixture to each well. 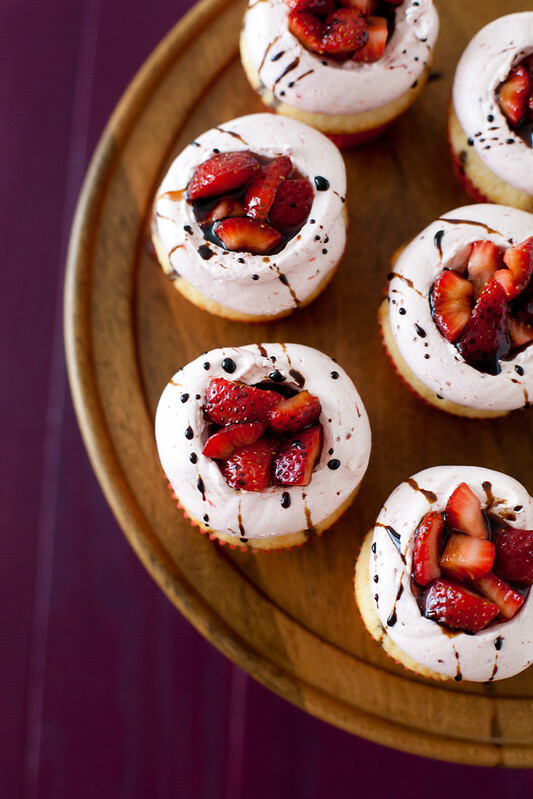 Drizzle the cupcakes with the balsamic glaze to finish.